Plants don't often move very fast or far by themselves, so they have evolved to get out there, meet mates, and reproduce. Some plants produce mini versions of themselves by using their stems, roots, or leaves. Other plants, such as flowers, have seeds that can be carried by the wind, water, or animals. Others still have spores. Flowers contain three reproductive organs. First, the anthers contain pollen, which is transferred to the stigma. The pollen then travels down to the ovary, which contains the eggs that ultimately become a seed. This process is called pollination. To be effective for pollination, pollen needs to be transferred from one flower to another or between different parts of the same flower. There are many different ways in which pollen can be transported. Wind can carry it from one plant or flower to another plant or flower, for example. 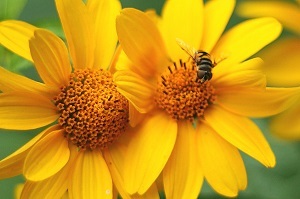 Other plants attract insects, animals, or birds that are carrying pollen by using a sweet smelling liquid called nectar. Pollen sticks to animals and rubs off when they visit surrounding plants. As soon as the flower is fertilized, the seed begins to form. When the seed becomes ripe, the plant lets go of it and sends it as far as possible to give it the best chance to grow. For example, chestnut seeds are released by exploding, acorns are spread by animals; sea beans are carried by water; and dandelion seeds are carried by the wind. Many plants can also reproduce without seeds. They do this by using their stems, roots, or leaves to make clones of themselves. This method is useful when plants exist in conditions that are difficult for seeds to thrive in. Some plants don't have petals, such as mosses, ferns, and worts. Instead of seeds, these plants reproduce by using spores. Unlike seeds, spores don't have much food to store. Consequently, they are only released when conditions are just right. Even though plants usually can't move, they have clever and unique ways of making sure their species survive. More often than not, this requires relying on other aspects of nature—like animals and the wind.